Barkear wrote: Barkear padded past her clanmates and into the nursery, squeezing inside carefully. Once inside, she dipped her head to the other queens and settled into an empty nest. Turtlesand wrote: Turtlesand padded out of her den, dragging the body of Molefang in her jaws. She made her way to the center of the clan camp, arranging the deputy's body so the clan could grieve. Barkclaw wrote: Barkclaw padded over and pressed her nose into Molefang's fur. Lemonstar wrote: Lemonstar pressed his nose to Molefang's fur, then tossed his head back in a yowl. "Cats of BadgerClan. Listen, And I will appoint the new deputy. 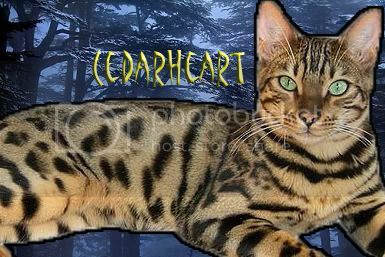 I say these words before StarClan so our ancestors may hear my approve and choice...Cedarheart will be the deputy of BadgerClan!" "Thank you, Lemonstar." meowed Cedarheart with a dip of his head. "Cedarheart, Cedarheart, Cedarheart!" cheered Wolftail for the clan's new deputy.